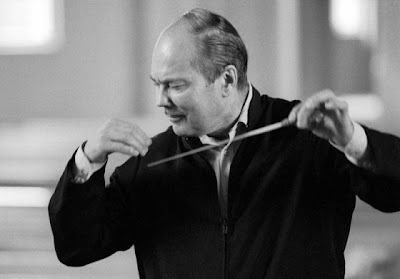 Finnish conductor Paavo Berglund, known for his interpretations of the music of Jean Sibelius, died yesterday after a long illness. He was 82. The conductor had withdrawn from the world of music in 2007 for health reasons. "He slowly faded away very peacefully," his daughter Alice told a Finnish newspaper. "The final cause of death was apparently pneumonia." A Helsinki native, the conductor made three separate complete surveys of the seven Sibelius symphonies. He also held important conducting posts in Helsinki, Stockholm and Copenhagen in the course of a long career. His EMI recordings, made with the Helsinki Philharmonic and the Bournemouth Symphony Orchestra helped elevate those ensembles to prominence. He also recorded symphonies by Dmitri Shostakovich and Ralph Vaughan Williams. Late in life, he made a final Sibelius cycle with the Chamber Orchestra of Europe. Mr. Berglund was known for leading performances of exceptional clarity and precision. Here's a really good performance of the autumnal Sibelius tone poem Tapiola. Now Headlining at Lincoln Center: Van Biesen!